Our mission is to provide friendly, professional and complete dental services that encourage our patients to take an active role in caring for their teeth and gums. In our warm, caring environment, you will find that our staff is extremely approachable and helpful throughout your entire visit. Bolton Park Dentistry performs a full range of cosmetic dental services, from simple fillings and teeth whitening to smile makeovers - all performed in a warm and caring environment. Our team at Bolton Park Dentistry. 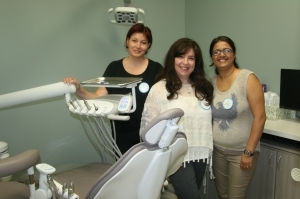 Pictured are Dr. Mindy Gelfand and our Dental Assistants, Larysa & Neepa in one of our Patient Care Rooms. Our staff, no matter where they work in our office, are committed to ensuring patient comfort and want to make your experience at our dental office a pleasant one. All Team members listen to patients and work hard to meet your needs. Dr. Mindy Gelfand, has been practising General Dentistry in Ontario for over 15 years, and, when asked, tells others that she loves working in dentistry more and more every day. Having been an Associate in dental offices over those years, she finally responded to suggestions she should open her own General Dentistry Practice and she chose to do so in Bolton!! Wanting to share her enthusiasm for dentistry, Dr. Gelfand has committed herself to writing a blog on this website to allow patients to get to share in her positivity about her profession, and hopefully to learn more about Bolton Park Dentistry and the oral healthcare services being offered in this great Town. 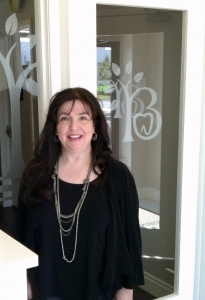 Dr. Gelfand is excited to become part of the Bolton community and to meet other members' oral healthcare needs!